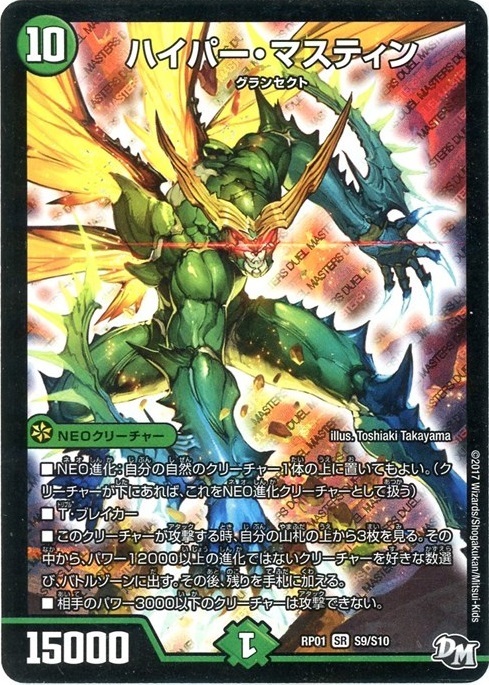 ■ Whenever this creature attacks, look at the top 3 cards of your deck. From among them, put any number of non-evolution creatures that have power 12000 or more into the battle zone. Then add the rest to your hand. ■ Your opponent's creatures that have power 3000 or less can't attack. Basically this decks uses the Ruins of the lion king 5 civilization strategies many of my ramps use. However in this one you can use Dark Life to fuel your grave and manipulate your mana zone, and the grave might be needed in this deck. Once you get 4 multicolored mana, use Ruins of the lion king to give yourself a good amount of mana. Then you can either expand Wild Safari Channel into your battle zone to increase your mana pool, or send out The=Deadman to give all your mana 5 civilizations. If your opponent has D2 Fields, Wachagona will help. If your opponent decides to rush you, the shield trigger kernels and deadbrachios will allow you to send out puchohenza for a comeback and intense vacuuming twist can deal with lone threats. Against Onikamas which is the hard anti for no cost trample, ramp to 10 mana and use Gaial victory legend or 11 mana into codeking mozart. Now to the main point; Hyper Mustin. Hyper Mustin can be evolved from a few creatures in this deck, like Puchohenza, The Deadman and Codeking Wilhelm. Codeking Wilhelm and The=Deadman will allow you to summon him next turn so they are the best. Make sure that you evilve him since his effect only activates when he attacks. And once you had Hyper Mustin attack, it's time for mass cost trampling our poweful fatties. VAN Beethoven can provide high quality lockdown and Viola Sonata can destroy an opposing creature and reanimate a dragon. Gaial, Victory Legend wipes out swathes of weenies and sends out more dragons for each opposing creature it destroys. Since most of the deck is dragons it is good. Gaial Mobius allows you to finish opponents in one shot and Mozart is needed to stop dragon decks without much removal. If you have another nature creature you can also cost trample another Hyper mustin to fuel destruction. The stuff that Mustin does not cost trample are not wasted since they end up in your hand. 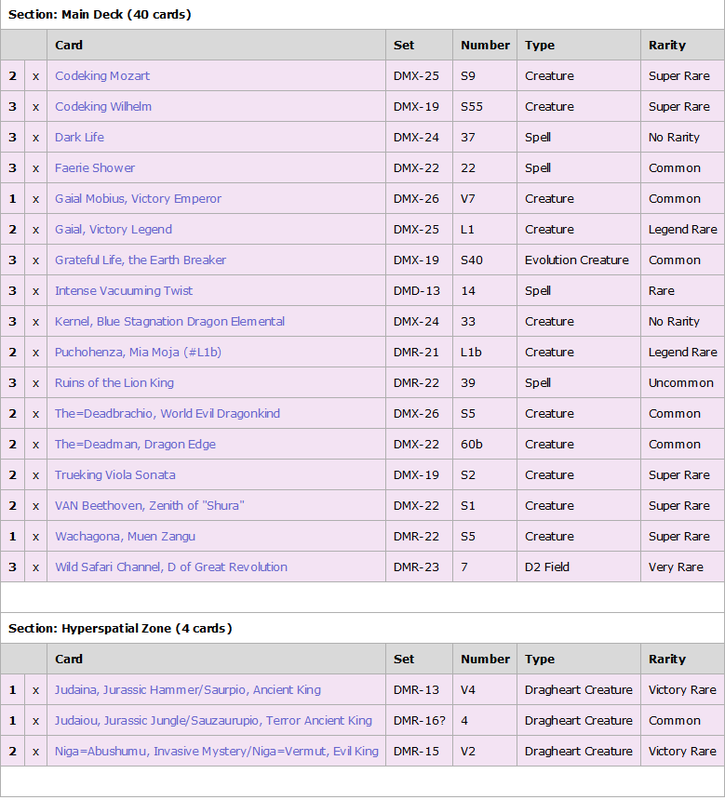 I am considering swapping a few cards with Shizenseijin for more mana boost and so i can recover hyper mustin. I am also considering Wald Brachio and Completely unidentified as well, but do not have space. 5000GT is a consideration too since it likely only affects the opponent in this case. Overall, i will have to test what works and what does not when jokers arrive so stay tuned.